with children, other animals, and they never see a stranger. Their tails are always waggin' to match their happy dispositions. our site for updates, upcoming litter information, and to view our latest pictures. are high and require regular inspections. 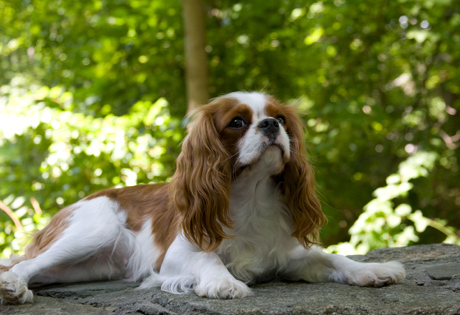 Cavalier's true purpose has always been that of companion. children and thrives as part of a family. The coat requires weekly brushing, but no trimming. The breed is adaptable in their need for exercise, happy with either sleeping on the couch or taking long walks. Toy Group; AKC recognized in 1995. Average size: 12 to 13 inches tall at the shoulder and between 13 and 18 pounds.